This year marked the 110th birth anniversary of Nanayakkarapathirage Martin Perera, better known as Dr. N.M. Perera; Leader of the Lanka Sama Samaja Party, popular labour leader, one-time Mayor of Colombo, outstanding Parliamentarian, Marxist, intellectual, sportsman, sometime film actor and above all a man whose life and contribution to our political evolution is commemorated with respect even today, nearly four decades after his death. The life and career of N.M. Perera, that young student from far-away Ceylon, surely made his teachers proud! It will be difficult for those born after independence to adequately comprehend the full meaning of being a colony; of a people on whom another had imposed. A ruler may impose his will on the ruled, a neighbouring tribe may hold sway for a time, but here was a very distant culture, an alien people whose ideas and ways were different altogether, an incongruous imposition. The British imperial rule, although undeniably an arrangement between a conqueror and the conquered, was multi-faceted nevertheless. Modernity was brought to many a people through its imperial imposition and reach. Some of the colonies could boast of civilisations much older. But by the time the European ships began to arrive on their shores the vigour of their civilisations had drained out. Trapped in a self-perpetuating system of outdated thoughts and ways, their governments had descended into corrupt courts overtly competing for the King’s favour but covertly disloyal, Byzantine intrigue representing statecraft. In terms of the standard of living of the people, methods of governance and all-round technology, they were no match to the alien men who had come on the large ships. But all the same, it was a foreign rule that rankled. The natives had no history of commerce or cash economy. Therefore, the British dominated commercial activity, the plantations, the professions and of course the administration. Even those few locals who subsequently climbed up in these professions were never allowed to forget who the top dogs were and that they were there only by way of leave. The native cultures and religions were viewed as obscure and primitive, generally to be ignored, but preferably either reformed or converted. It was only natural that there were undercurrents of resentment and sometimes even open tensions between the conquered people and the imperial government. But by and large the colonial administration was able to minimise conflict to manageable proportions and only occasionally did matters get out of hand, like in the Riots of 1915 when the British suppression surpassed acceptable limits, a clear breach of trust by the ruler. Empires creating their own nemesis is a recurring theme in history. In the Roman times Germanic tribes challenging the Roman Empire were often led by barbarians who had at some point served as legionaries in the Roman army, even holding high rank. Thus they were familiar with Roman military tactics and furthermore had a good insight into the Roman mindset. Similarly, in the 20 Century, many of the liberation struggles in the colonies were led by men who had been educated in the mother country, benefitting from an education given by the colonial power. We had Zhou-En-Lai in China, Ho Chi-Minh in Vietnam, Gandhi and Nehru in India and even here in little Sri Lanka several of those who led the struggle against the British imperialist were men who had received the best of a British education. N.M. Perera returned home from England in 1933, where he had gone to study, a committed socialist, determined to participate in the struggle for independence. Much has been written about the founding of the Lanka Sama Samaja Party (LSSP) in 1935, the first political party in Sri Lanka, and its impressive contribution in the political/social fields. From that promising launch, the subsequent sterling performances in the Parliament by its leading members such as NM and Philip (Gunawardena), their unwavering espousal of those at the bottom of the social heap and the Party’s fearless opposition to the colonial rulers made them into legendry figures. Looking through the political realities of today, it is hard to imagine that at one time the LSSP was the largest Opposition party (the party in waiting) and its Leader, Dr. N.M. Perera, the Leader of the Opposition. The LSSP also claimed leadership of the organised labour movement; NM until his death was the charismatic President of the then mighty Federation of Labour, a confederation of powerful trade unions. NM was a genuine product of British seats of learning and generally spurned the fulsome use of the title ‘Doctor’ in front of his name as commonly done in these parts by many, far lesser men, as an honorific. Eventually he may have compromised on this, due to political and cultural pressures. The late Regi Siriwardena, Professor of English, recounts an interesting episode concerning NM when the LSSP was functioning underground and for the purpose of security party members used pseudonyms. Siriwardena who was then an undergraduate was “Hamid” for party purposes. At a Party conference in 1941, it was decided that the LSSP merge with its Indian counterpart in order to become a larger and therefore more effective organisation. The only opposition to the proposal came from the very junior comrade Regi Siriwardena. “I was imprudent and brash enough to criticise the Indian plan as ‘adventurist’, urging that the party should concentrate on strengthening its local base. For this parochial view I was verbally slapped down by NM who in the course of his reply said, ‘We can’t all be as learned as Comrade Hamid.’ This from a double-doctor to an undergrad, was irony indeed” – Regi Siriwardena, Working Underground – LSSP in Wartime. Given the Party’s ideological orientation it was only natural that the history of the LSSP is bedevilled by fierce schisms. Some of the resulting splits were extremely damaging, perhaps even denying the Party the opportunity to form a government. Almost from the beginning the LSSP had committed itself to the democratic method as a way of achieving its goals. The watershed of 1956 changed the electoral configuration entirely, leading the LSSP inevitably towards the fateful Party Convention of 1964 which endorsed by a large majority a resolution by the N.M. Perera faction to join the SLFP coalition led by Sirima Bandaranaike. 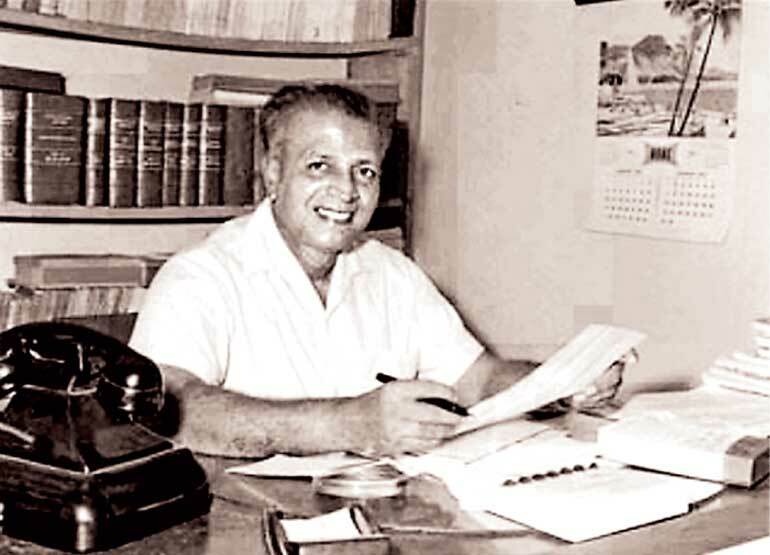 When the coalition triumphed in 1970, Dr. N.M. Perera became the Minister of Finance. Although it seemed a high point in an illustrious career, in fact his political downfall was drawing near. An idealist, a revolutionary, joins a union not of his making, at his own peril. At the best, it was an uncomfortable alliance, at the worst a hotchpotch doomed from the start. By 1975 it was all over, the LSSP was out in the cold again and moving towards its denouement in 1977 when they were voted out of Parliament, lock, stock and barrel, NM also losing his stronghold of Yatiyantota, a seat which had returned him at every election since 1935. N.M. Perera passed away in 1979. Too much to expect of the LSSP? Perhaps it was too much to expect of the LSSP, when globally the socialist ideology has been on the retreat for decades. In the few countries where socialist parties had gained power, economic inefficiencies, seemingly inherent in the system, resulted in a gradual deterioration of living standards in those countries. It was also evident that even an ideology so given to social equality could not escape the inevitable bureaucratisation and the accrual of privileges to the party elite; as brilliantly put by Orwell “all animals are equal – but some are more equal than the others!” Changing human nature proved to be far more difficult than social re-arrangements. Whatever the political posture or dogma it may have adopted at various stages of its long and difficult evolution, the LSSP’s historical role may have been to hold out a possibility of something better, a shining hope for the future. Perhaps it was all utopian, an ideal which ignores the crass realities of life, a lost horizon-never to be reached. NM’s memory is valued not for some hair-splitting ideological purity. It is other things, the personality of the man, his democratic instincts, wide reading, broad attitudes, liberal temper, cosmopolitan tastes that we look up to. The public of today will scarce believe that NM as a Minister of the Government would leave his official car at home to drive his own vehicle for an evening’s game of tennis. Every month, on receiving his salary cheque, he would join the queue at the bank in order to cash it. It would not have occurred to him to do otherwise, surely he was the Minister of Finance! He had to be the role model of financial rectitude! It was Professor Harold Laski, the famous ideologue of the left wing of the British Labour Party, then teaching at the London School of Economics who first interested NM in social issues. The subsequent life and career of N.M. Perera, that young student from far-away Ceylon, surely made his teachers proud!